The digital media landscape hasn't exactly plateaued in the past few years, as was once predicted. If anything, the ever-expanding proliferation of portable devices and media formats has made it rockier than ever before. This is a fact that hasn't escaped the attention of numerous software developers, who've busily churned out iPod converters and PSP movie packages like there's no tomorrow. As befits a company of Roxio's long-standing reputation in the media authoring field, it's attempting to cover as many of these bases as possible in its latest product. As a result Copy and Convert is just as happy burning movie discs as it is preparing media for your iPod. The interface has a lot in common with Roxio's previous low-level tools. It's blissfully simple and it's almost impossible to go wrong with the menu system, which uses plain language to lead you to the various tools. In terms of copying, it's just about what you'd expect. You can't rip commercial DVD movies, but you've got the option of either making a direct copy of unprotected CDs and DVDs (on-the-fly, if you've got two drives) or grabbing the video and turning it into any other format. The interface simplicity continues here, leading you easily towards the appropriate format for your target device. While this might be seen as a turn-off by more technical types, with the impressive range of formats on offer, it should please everyone. You can go the other way, burning assorted DivX files to a DVD compilation with the help of custom menus. It's missing the obvious ability to burn custom data CDs, but it's up-to-date enough to support HD formats. That doesn't just mean it can manage high-resolution videos - it can competently rip from Blu-ray, too. That's not all - Roxio really does seem to have dragged in some of the most useful features a mediaphile could desire. It'll catalogue each of your burned discs, for a start. If you're sensible about storing your discs, the catalogue makes searching for and locating that elusive backed-up file a simple, two-step process. 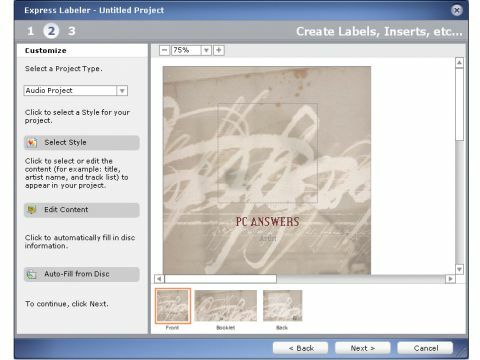 If you're one of the fancy few to buy into it, Lightscribe support means that you can use the reasonably limited labelling tool to generate your own disc etchings. Those without can make do with regular case inserts. For all its simplicity, this is a pretty powerful package for your £20. You can rip from multiple drives at a time (provided your PC is up to it), and even rip and mount ISO images of your discs, replicating the most useful feature of the questionable-but-useful Daemon Tools. This is extra handy on a laptop; without the drive spinning, you should be able to milk some extra battery life from your machine. The likelihood is that you've already got some sort of media burning tool. The majority of new PCs already come with one installed, and these days it's increasingly hard to get by without one. Similarly, you've probably bought a generic video converter if you're passionate about getting your movies on whatever portable device you prefer. Yet if you're somehow without either option, then Copy and Convert is a pleasure to recommend, and even if you're already fully equipped it might be worth a purchase solely on the basis of such a sensible approach to ease of use. We do have one slight problem, though. If you're inclined to tinker around or you want to burn more than just movie DVDs then you might find this limiting. In that case investing in a more tooled-up package, such as Roxio's own more comprehensive offering, Easy Media Creator, or Nero 7 is definitely the way to go.